The NCAA Basketball Tournament tips off on Tuesday, March 19th. As always, the tournament will feature the usual bracket busters and upsets that drive bettors and basketball fans bananas. The first weekend of the NCAA Basketball Tournament is always packed with hardwood action. It is wall to wall basketball during the first two rounds and it never disappoints. On Sunday, March 17th, the NCAA selection committee will pick the teams in the tournament. It is always a controversial day with teams having their bubbles burst. ZCode System looks at the upcoming tournament and the teams leading sportsbooks have listed as their favorites. The Duke Blue Devils may be fifth in the country, but leading sportsbooks have them listed as the tournament favorite. It may be a shock to many college hoops fans, but if there is one thing they should know, it is to never count out Mike Krzyzewski’s team. Zion Williamson is back on the court and wearing new shoes. He missed six games after his crazy shoe explosion against North Carolina. Duke treaded water without him and is ready to soar now. In his first game back against Syracuse on Thursday night, Williamson played 35 minutes and scored 29 points. He added 14 rebounds to his stat line as Duke won 84-72. 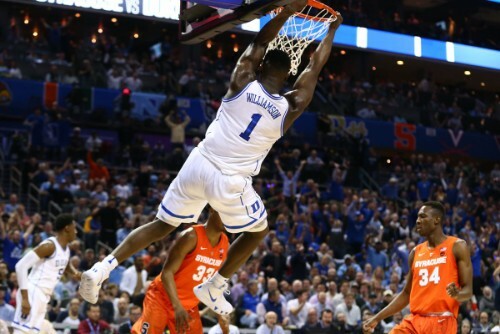 Williamson is Mr Electricity and Duke look unstoppable with him in the starting lineup. The Gonzaga Bulldogs may be the most overrated basketball team year in, year out. The Bulldogs always play great through the regular season. They get some big wins and kill everyone in their conference, but when it comes to the big games in the NCAA Basketball Tournament and they slip up. For all the praise and talk about Gonzaga over the years, the team has never won the NCAA tournament. The Bulldogs best performance was a runner-up finish in 2017. How overrated is Gonzaga ahead of the tournament? Gonzaga was beaten by West Coast Conference rivals St. Mary’s 60-47 on Wednesday. St. Mary’s is 22-11 and not even ranked in the top 25. Gonzaga went into the game as the nation’s No. 1 team at 30-3. Virginia head into the ACC Tournament as the nation’s No. 2 team. Head coach Tony Bennett’s Cavs have reeled off nine straight wins at the time of this writing. The Cavs are 29-2 and have a claim for the No. 1 ranking. Virginia wrapped up the ACC regular season title for the second season in a row. It will most likely get them a No. 1 NCAA Basketball Tournament seed regardless of the ACC Tournament’s outcome. The Cavs haven’t been to the Final Four since 1984. Unlike Duke, they don’t have recent success in the tournament on their side. Which team beat Virginia twice this season? Duke. The No. 4 ranked Kentucky Wildcats are leading sportsbooks’ fourth favorite. Kentucky has posted a 26-5 record as of this writing. According to major sports media outlets in the U.S., including ESPN, Kentucky’s chances of going the distance in the NCAA Basketball Tournament are not great. Coach John Calipari’s team has lost to Duke, Seton Hall, Alabama, LSU, and Tennessee. Three of those teams are top 25 sides. 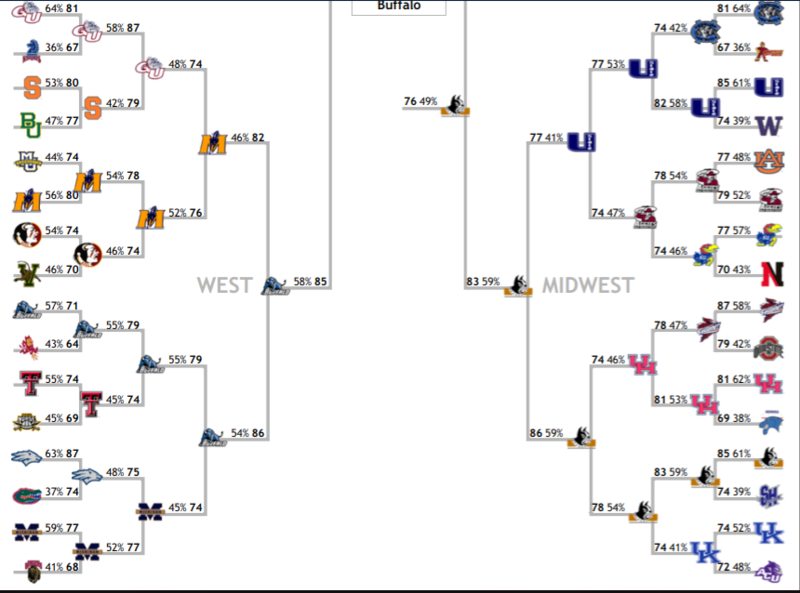 How does the ZCode System Playoff Simulator belive the NCAA Tournament will end? 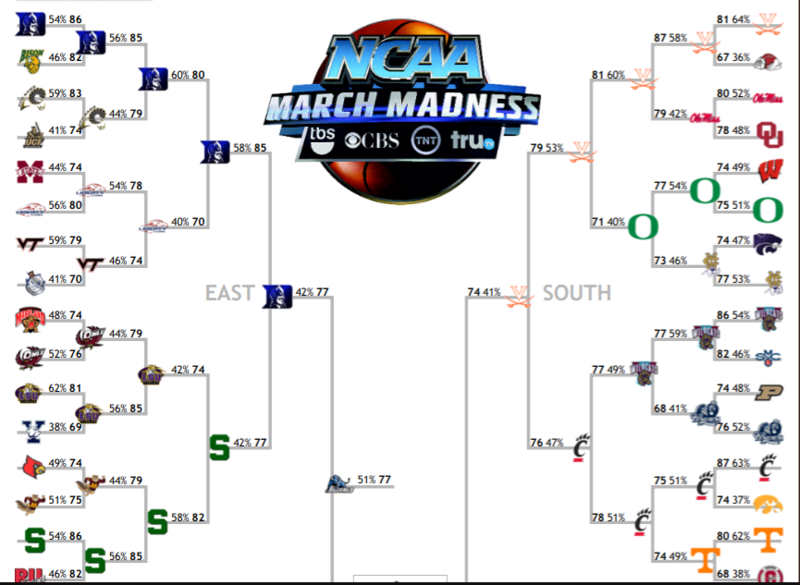 Well, have a look and see if it busts your bracket.